Sarah’s Creamery delights both the young and old with ice cream straight from the Berkey Creamery at Penn State University’s Main Campus, as well as with our handmade ice cream which is also made with high quality ingredients and a 14% butterfat content. We have seating for over 40 inside and lots of seating outside on our huge patio, wraparound porch and picnic tables in the grass. While visiting us try out our lawn games or just relax and listen to the nostalgic music of yesteryear! Visit us at our old fashioned (with a modern twist) ice cream parlor at 121 S. Main St., Dover PA.
Sarah’s Creamery was started by a local businessman and Penn State graduate Jerry Shaffer, who loves ice cream and wanted to bring the best ice cream to Dover, PA. Over the past 15 years he often talked about it to his family, but it remained only a dream until the building it now resides in became available. With the whole family on board Sarah’s Creamery, which was named for his daughter, was built. At Sarah’s Creamery, we feature Penn State Ice Cream direct from the Berkey Creamery at the Pennsylvania State University. For over 100 years Penn State has been making and teaching the science behind making the best ice cream. They have taught the founders of Ben and Jerry’s how to make ice cream and Penn State is an international center for the making of ice cream. 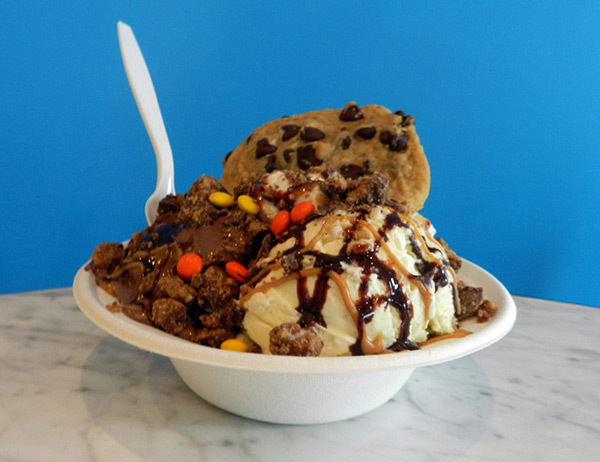 Sarah’s also offers over 16 flavors of handmade ice cream, gourmet ice, expertly decorated waffle cones, fresh homemade waffle cones and bowls and a huge topping bar with over 30 toppings where you can make your sundae just the way you want it. We offer 16 flavors of Penn State and over 16 flavors of handmade ice cream. We want you to have your ice cream the way you want, so tell us how much you want and you add the toppings the way you like to make your own sundae!